For the latest news about LAMS, see the monthly newsletter at the LAMS Community. The 3rd International LAMS Learning Design Conference is being held at the Macquarie Graduate School of Management, Macquarie University on Friday, December 5th, 2008. The theme for this conference is "Perspectives on Learning Design" to explore many different approaches to Learning Design. As past LAMS conference attendees will know, LAMS Conferences have had a broad Learning Design focus rather than just being about LAMS. We're changed the title of this (and future) conferences to "LAMS & Learning Design" to acknowledge that the broad range of approaches to the field are always welcome at these conferences. Keynote Speakers are Professor Diana Laurillard from the University of London; Leanne Cameron, Matthew Kearney and a group of their students to discuss a combined staff/student perspective on LAMS; Paul Gagnon from Nanyang Technological University, Singapore, and Professor James Dalziel, MELCOE, Macquarie University. A Summit on Pedagogic Planners is being held on December 8th at the University of Sydney - this event is co-hosted by the University of Sydney, Wollongong University and MELCOE, Macquarie University. The conference is also the launch date for LAMS V2.2, which includes "Tools Wrappers" for external activity tools from Moodle, .LRN, Google Maps and others. It also includes many other new features and improvements - see the LAMS Roadmap for more details. The 3rd International LAMS Conference website contains programs, presentation slides, audio and published proceedings and is available here. The Conferencia Iberoamericana LAMS 2008 / 2008 European LAMS Conference is being held from 25th-27th of June, 2008 in Cadiz, Spain. In addition to English language presentations, we're delighted to announce a full day of Spanish LAMS presentations held on the 25th of June. The conference also included a workshop on Pedagogic Planners on the 27th of June. The conference will be opened by Professor Eduardo Blanco Ollero, Vice-Rector, University of Cadiz. Keynote speakers for the conference are Stephen Downes, Professor Gráinne Conole, Open University UK, and Professor James Dalziel, MELCOE. Coinciding with the conference is the launch of LAMS V2.1, a major new version of LAMS which includes the powerful "Branching" feature to allow students to follow different learning pathways within LAMS. For details of this and other features, see the LAMS Roadmap. The 2008 European LAMS Conference website, including program, presentation slides, audio and published proceedings is available here. After the success of the First International LAMS Conference in 2006 and the 2007 European Conference, we are holding our second International Conference in Sydney from the 26th to the 29th of November, 2007. Keynote speeches, presentations and workshops will be held on campus at Macquarie University in North Ryde. The focus of the conference will be on the practical benefits of Learning Design. What are the challenges for individuals and organisations? Importantly, we want to capture the experience of those who have used LAMS and share some of the lessons learnt about learning design in higher education, the K-12 sector, vocational and professional education. Following feedback from previous conferences, in addition to our general program, this conference will feature two additional strands: one for those new to LAMS and another for Teacher Educators. The 2nd International LAMS Conference website, including program, presentation slides, audio and published proceedings is available here. The first European LAMS Conference is being held on the 5th of July, 2007 at Greenwich University in London, UK. The conference provides an opportunity for LAMS users and researchers in the UK and the rest of Europe to come together to explore the impact of the LAMS approach to teaching and learning. The focus of this conference, like the 1st International LAMS Conference in Sydney, 2006, is where will Learning Design take us now? How is LAMS shaping up? What are the challenges for individuals and organisations? Importantly we wanted to capture the experience of those who have used LAMS and share some of the lessons learnt in higher education, the K-12 sector, vocational and professional education. Keynote speakers include Professor Diana Laurillard, London Knowledge Lab, University of London and Professor James Dalziel, MELCOE, Macquarie University. The conference includes a workshop on Pedagogic Planners to be held on the 6th of July at the London Knowledge Lab, University of London. The 2007 European LAMS Conference website, including program, presentation slides, audio and published proceedings is available here. Following extensive testing during 2006, the final V2.0 release of LAMS is now available – see the feature list for a full description of new features in LAMS V2. LAMS V2 represents a major milestone in the evolution of LAMS. V2 is a ground-up re-write of the original LAMS software, based on the lessons learned from the first version, together with input on many new features from LAMS users. LAMS V2 provides the foundations for many years of further development. LAMS V2 provides a new architecture to support integration of external tools, as well as greater robustness and scalability. Details of the new architecture compared to LAMS V1 are available on the wiki, here. A series of incremental improvements and bug fixes are planned as 2.0.x releases during 2007, followed by a major new release (V2.1) in 2008 that will incorporate “Branching”. 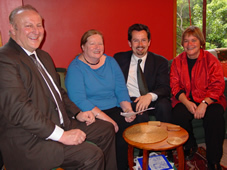 The release of LAMS V2 co-incides with the 1st International LAMS Conference, held on 7-8th of December, 2006 at the Sydney Conservatorium of Music, Australia. The LAMS conference is an opportunity for LAMS researchers and implementers to share experiences with LAMS in a range of educational settings, including universities, schools and training contexts. Keynote speakers include Professor Ron Oliver (Edith Cowan University), Penny Carnaby (National Librarian of New Zealand), Professor Diana Laurillard (University of London – remote presentation) and Professor James Dalziel, MELCOE, Macquarie University. The 1st International LAMS Conference website, including program, presentation slides, audio and published proceedings is available here. The beta version of LAMS V2 was launched in July. What new features are available, and how can publishers get involved? LAMS V2 has been almost two years in the making, and is intended to move from beta to full release in October 2006. The team at Macquarie University in Australia responsible for the new version listened closely to feedback from the LAMS community and introduced a range of new features to supplement the existing toolset, which already enables teachers to achieve two significant tasks: easily create, run and manage sequences of learning activities using a drag and drop interface, and share these sequences. Click here for the full text of this story. 11th April, Oxford, UK. The LAMS Foundation is pleased to announce the public release of LAMS V2.0 alpha. This is a major milestone for LAMS, as it represents the initial release of the new architecture and platform for future LAMS development for the next 3-5 years. "This is a great achievement by the LAMS development team," said Professor James Dalziel, Leader of LAMS. "The new version provides a platform for innovation and scalability for LAMS into the future. We look forward to continuing our development and working with other developers around the world to build the next generation of e-learning innovation using LAMS." The new version is ready for software developers to download, compile and run, and to begin exploring how to contribute to ongoing development of LAMS V2.0 via the public CVS. As an alpha release, it is not yet ready for use by teachers, but a teacher ready version will be available later in 2006 after further development and testing. LAMS V2.0 was previously known as LAMS V1.1, because when the development began 18 months ago, it was initially planned as a partial redevelopment. However, as the project progressed it became a ground-up rewrite, based on the many valuable lessons learned over the first four years of LAMS development. With this initial public announcement of the new version, it was an appropriate stage to rename it to recognise it as a major new release. Among the many new features of LAMS V2.0, it includes the ability to run in languages other than English. In the two weeks since the release of translation facilities, over 15 translations are underway, including Italian, French, German, Chinese, Korean, Norwegian, Maori and many others. Further details about new features are available at the feature list. WASHINGTON, DC Blackboard Inc., a leading provider of technology to educational institutions and LAMS, the world's leading open source learning design system, today announced the availability of the LAMS Blackboard Building Block, a unique software application for designing, managing and delivering online collaborative learning activities. This new Building Block provides instructors with an intuitive drag and drop authoring tool for creating learning activities for students. Using the LAMS Building Block instructors can design individual tasks, small group activities and whole class activities then organize them in sequence for students to collaborate and learn. The LAMS Building Block seamlessly integrates with Blackboard and is available for download, free of charge in the Blackboard Building Blocks catalogue at http://www.blackboard.com/extend/b2/. Blackboard Building Blocks are third party applications which enable academic institutions to extend and customize their Blackboard® application. "The LAMS Building Block is a prime example of open source and Blackboard working together towards the common goal of enhancing education," said Matthew Pittinsky, Chairman of Blackboard. "This new tool clearly demonstrates that open source and corporate developed/supported software do not and should not be mutually exclusive of each other; but instead can work side by side to create an end result greater than the sum of the individual parts. It is tremendously exciting to work with LAMS to facilitate this kind of cutting edge functionality." Nanyang Technological University in Singapore is the first academic institution to utilize this new tool. "Our LAMS integration within Blackboard has enabled us to package our distance education offerings and provide more stimulating and engaging interaction," said Paul Gagnon, Senior Deputy Director of the Centre for Educational Development at Nanyang Techological University. "Lectures are videotaped, chunked, inserted within a LAMS activity and surrounded with a variety of interactive strategies. We are still in our infancy with this technology but are very excited about the vistas it opens." Blackboard provides the e-Learning platform used by colleges and universities across the country and abroad. LAMS provides open source software for the education market across all sectors to design and deliver collaborative lessons over the Internet. Blackboard and LAMS together will provide greater convenience and easier access to educational resources to the members of academic institutions around the world. Blackboard Inc. is a leading provider of enterprise software applications and related services to the education industry. Founded in 1997, Blackboard enables educational innovations everywhere by connecting people and technology. With two product suites, the Blackboard Academic Suite™ and the Blackboard Commerce Suite™, Blackboard is used by millions of people at academic institutions around the globe, including colleges, universities, K-12 schools and other education providers, as well as textbook publishers and student-focused merchants that serve education providers and their students. Blackboard is headquartered in Washington, D.C., with offices in North America, Europe and Asia. LAMS International is the organisation that provides a range of services built around the LAMS software. These services include; technical support, hosting, training, integration and software development. Any statements in this press release about future expectations, plans and prospects for Blackboard and other statements containing the words "believes," "anticipates," "plans," "expects," "will," and similar expressions, constitute forward-looking statements within the meaning of The Private Securities Litigation Reform Act of 1995. Actual results may differ materially from those indicated by such forward-looking statements as a result of various important factors, including the factors discussed in the "Risk Factors" section of our Quarterly Report on Form 10-Q filed on November 7, 2005 with the SEC. In addition, the forward-looking statements included in this press release represent the Company's views as of January 24, 2006. The Company anticipates that subsequent events and developments will cause the Company's views to change. However, while the Company may elect to update these forward-looking statements at some point in the future, the Company specifically disclaims any obligation to do so. These forward-looking statements should not be relied upon as representing the Company's views as of any date subsequent to January 24, 2006. LAMS, the world's leading open source Learning Design system, today announced the release of a new version of the software - V1.0.2. Complementing this release are three LMS integrations, a suite of new services and support contracts from LAMS International, and the announcement that LAMS International has joined the Moodle Partner network to help support combined Moodle/LAMS installations. The latest version of LAMS includes powerful new features such as the "HTML Noticeboard" tool, which allows teachers to incorporate rich web content directly into LAMS Noticeboard pages, including images, animations, videos and links to other websites. Another new feature is a direct link from a teacher's LAMS account to the LAMS Community. In addition, LAMS V1.0.2 includes hundreds of improvements and bug fixes to enhance the overall user experience. For LAMS administrators, V1.0.2 includes new web services interfaces for easy integration between LAMS and Learning Management Systems. Integration has been completed with Moodle, Blackboard and Sakai, and integrations with WebCT (CE4), .LRN and uPortal are planned for the near future. Further details of LAMS integrations are available at www.lamsfoundation.org/integration/. Getting access to LAMS is now even simpler. To gain access to a trial account for LAMS, teachers can sign up at www.lamscommunity.org/testdrive/. Teachers who already have a trial account with LAMS should see their server upgraded in the near future. Administrators managing an existing version of LAMS who wish to upgrade to the new version can obtain a simple updater from www.lamsfoundation.org/downloads/. Administrators who wish to set up a new LAMS server can access the LAMS V1.0.2 Installers (and technical manuals) at www.lamsfoundation.org/downloads/. Complementing the new version, LAMS International Pty Ltd - the services and support company for LAMS - has released a set of standard packages for LAMS technical support and hosting services, starting from $995 per year. Details are available at www.lamsinternational.com/product/moodle.html. Finally, due to the great interest shown in LAMS within the Moodle community, LAMS International has joined the Moodle Partner network to support combined Moodle/LAMS installations. Support is available from LAMS International (via existing Moodle Partners) for integrating LAMS into Moodle, either through combined installations of Moodle and LAMS onsite, or through a secure link from Moodle to a hosted LAMS server. Details and pricing are available at www.lamsinternational.com/product/. "We welcome LAMS International to the worldwide Moodle Partner network," said Martin Dougiamas, leader of Moodle, "Our agreement to work closely together means that customers who want to implement both Moodle and LAMS in an integrated way will get the very best possible combined support from Moodle experts and LAMS experts as required." The LAMS software is freely available as open source under the GNU GPL. LAMS development is led by the Macquarie University E-Learning Centre of Excellence (MELCOE) in Sydney, Australia. LAMS is managed by the non-profit LAMS Foundation, with support services provided by LAMS International Pty Ltd. Both LAMS organisations are supported by Macquarie University. Sakai, the world's leading open source Collaboration and Learning Environment, and LAMS, the world's leading open source Learning Design system, today announced successful integration between the systems. This integration allows teachers and professors to benefit from Sakai's highly scalable learning platform combined with the unique "digital lesson planning" approach of LAMS. "This is great news for the Sakai community", said Dr Brad Wheeler, Associate Vice President and Dean of IT, Indiana University and Sakai Project Board Vice Chair. "Integrating LAMS with Sakai brings a rich new set of features for planning and delivering sequences of online learning activities," he said. Professor Joseph Hardin, School of Information, University of Michigan and Sakai Project Board Chair, heartily agrees, saying "LAMS' visual authoring environment will create new ways for faculty to imagine and implement innovative e-learning in conjunction with Sakai's robust course management, collaboration, and research support functionality." The integration of Sakai and LAMS makes it easy for faculty to select existing LAMS "sequences", or author new sequences, and add these to their course pages. Students then access sequences via a simple link on their course page. The integration achieves "single-sign-on" - once a teacher or student has logged into Sakai, no additional login is needed to access LAMS. For faculty, a LAMS sequence which is created in one course can be re-used or adapted for another course, or shared with colleagues anywhere. "The combination of LAMS and Sakai presents a powerful new force for innovation in education" said Professor James Dalziel, leader of LAMS. "This integration takes the student experience of e-learning beyond traditional course pages, and into an era of rich online interaction and collaboration. For faculty, sharing and improving LAMS digital lesson plans represents the birth of 'open source teaching'" he said. Details of the integration are available from www.lamsfoundation.org/integration/sakai2 including animations of the two systems in action and a registration page for access to a live demonstration server. Support for the integration of Sakai and LAMS was provided by Cambridge University, with the integration code being released under the OSI approved Educational Community License. Going beyond this initial integration, Sakai and LAMS will explore closer tools integration so that in the future, for example, the Sakai Forum could function inside a LAMS sequence. "We are really excited about the technical aspects of the integration of LAMS into Sakai, and about enhancing the functionality of Sakai tools so they can richly interact with the LAMS workflow engine. We look forward to working more closely with LAMS, and visiting the LAMS team in Sydney, Australia in early 2006 to begin co-ordinating this work," said Dr Charles Severance, Chief Architect of Sakai. The Sakai software is a community source effort to develop a platform for innovation in collaboration, teaching and learning, and research support software. The project is led by the Sakai Foundation (see sakaiproject.org). LAMS development is led by the Macquarie University E-Learning Centre of Excellence (MELCOE) in Sydney, Australia. LAMS is managed by the non-profit LAMS Foundation, with support services provided by LAMS International Pty Ltd. Both LAMS organisations are supported by Macquarie University. 30/09/2005 LAMS launches the LAMS Community: the birth of "open source teaching"
The LAMS Foundation today launches the LAMS Community, a global community website for teachers and developers who use the revolutionary open source LAMS software. LAMS creates "digital lesson plans" that can be run online with students, as well as shared among teachers. The LAMS Community allows teachers to share and adapt digital lesson plans, and discuss their experiences of using LAMS. This announcement signals the birth of "open source teaching", as the LAMS Community encourages the sharing of digital lesson plans under open content licences (using Creative Commons). Now teachers, trainers and professors can find digital lessons plans that are freely available to use and adapt, and they can share their own creations and adaptations to the benefit of all education. The LAMS Community is based on the MIT developed open source ".LRN" community platform. Professor James Dalziel, leader of LAMS, recently met at MIT with Alfred Essa, Founder and Co-Chair of the .LRN Consortium, to formalise the use of .LRN for the LAMS Community. 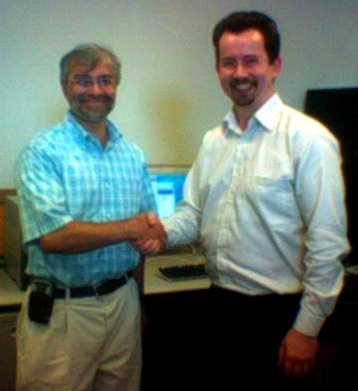 Alfred Essa (left) and Professor James Dalziel at MIT formalising the use of .LRN for the LAMS Community. "We are delighted LAMS will use .LRN to host the LAMS Community," said Alfred Essa, "LAMS is a comprehensive open source system for designing and implementing sequences of learning activities. Its visual authoring environment is very impressive". "The LAMS Community is central to our strategy of empowering teachers to transform education using the revolutionary digital lesson planning approach offered by LAMS. Educators can now freely and openly share 'best practice teaching' in a way never seen before in the history of education," said Professor James Dalziel, leader of LAMS. "We chose .LRN for its sophisticated community management functions, complementary feature set, and our shared open source philosophy," Dalziel said. The LAMS Community will benefit from powerful .LRN features for community-based news, discussion forums and sharing of digital lesson plans (or "sequences") and other resources. Initial communities will cover Developers, Technical support and Education including sub-communities for K-12, Higher Education & Training, Research & Development and a new users group called Getting Started. In the future, new sub-communities can be added as interests develop, for example, introductory psychology, maths teachers in the Boston area, occupational health and safety training for retailers, and so on. The most powerful feature of the LAMS Community will be the ability to share LAMS sequences. Teachers will be able to share their sequences with others, search for sequences, rate sequences and discuss sequences. It will even be possible for sequence contributors to see how many times their sequences have been downloaded. The recommended licence for LAMS sequences will be an open content licence, using the Creative Commons "share alike" approach, encouraging open source teaching. In addition to using .LRN for the LAMS Community, LAMS today announced plans to provide integration between LAMS and .LRN for course management, to be available in the coming months. This integration will follow a similar approach to that recently announced between LAMS and Moodle. John Norman, Director of the Cambridge University Centre for Applied Research in Educational Technology praised the LAMS/.LRN collaboration, saying, "Both .LRN and LAMS have set the pace in the development of collaborative/active learning platforms for higher education. This integration and co-operation between the two projects will create a powerful learning environment for students". The LAMS Community is now open at www.lamscommunity.org. Both LAMS and .LRN are freely available as open source software under the GNU General Public Licence .LRN is available from dotlrn.org, and is managed by the .LRN Consortium. LAMS is managed by the not-for-profit LAMS Foundation, with support services provided by LAMS International Pty Ltd. Both LAMS organisations are supported by Macquarie University. Moodle, the world's leading open source Course Management System, and LAMS, the world's leading Learning Design system, today announced plans for integration. This means thousands of existing Moodle sites will be able to easily incorporate the revolutionary "digital lesson planning" approach provided by LAMS. The integration will be freely available by the end of July. "This is excellent news for Moodle and LAMS users alike," said Martin Dougiamas, leader of Moodle. "Moodle and LAMS make a great complementary package. Moodle users will be drawn towards the fun and powerful design tools that LAMS provides, and LAMS users will be able to take advantage of Moodle's popular capabilities for managing communities of learners within a dynamic web site." "We're delighted to announce this integration between Moodle and LAMS," said Professor James Dalziel, leader of LAMS. "It demonstrates the powerful benefits of combining a Course Management System like Moodle with a Learning Design system like LAMS to create a new generation of e-learning technology. The combination of flexible course pages (Moodle) with structured activity sequences (LAMS) can significantly enhance student learning," he said. The New Zealand Ministry of Education is sponsoring the integration. "We've had strong interest in both Moodle and LAMS in New Zealand, and particularly in bringing the two systems together," said Elizabeth Eppel, Deputy Secretary. "We see great benefits to New Zealand education arising from an integrated Moodle/LAMS approach, so we were keen to support this development," she said. "While LAMS can integrate with a range of popular e-learning systems, we've been very pleased with the enthusiasm and pro-active approach of Martin Dougiamas on behalf of Moodle," said Dalziel. "This integration will benefit not only school teachers and university lecturers, but also the growing number of vocational and corporate trainers using Moodle and LAMS," Dougiamas said. Both Moodle and LAMS are freely available as open source software under the GPL. Moodle is provided through the Moodle.org community website, with support services available from Moodle.com. LAMS is managed by the not-for-profit LAMS Foundation, with support services provided by LAMS International Pty Ltd. Both LAMS organisations are supported by Macquarie University. Following successful trials at Macquarie University and over 40 schools and 35 universities/colleges in UK and Australia during 2004, the revolutionary new e-learning system known as LAMS – the Learning Activity Management System – will be officially launched as freely available open source software on Wednesday 13 April. LAMS is an innovative software program that allows teachers to design, manage and deliver online collaborative learning activities while giving students an interactive environment in which to do their work. It is effective in various modes of delivery (face to face, distance), and while it has obvious applications within the school and university sectors, it can be equally well applied to other educational settings, such as corporate and vocational training. Teachers use LAMS to design a sequence of learning activities for students that includes content and collaborative tasks. It then runs the sequence of tasks for students, allowing teachers to monitor and track student progress. It has impressed many senior educators who have followed its progress in a series of trials around the world prior to its official launch, with the software already being used at two of the world’s top universities, Oxford and Cambridge, as well as several Australian universities. LAMS is also being trialled in more than 40 schools and 15 polytechnics in Britain, the US and a number of schools in Australia, including Tara Anglican School for Girls, Normanhurst Boys High School and Glenorie Public School. LAMS has the potential to dramatically increase student engagement and learning: in one K-12 school pilot evaluation, only 16 per cent of students were willing to discuss ideas in front of their peers in the classroom, but over 83 per cent of the same students were willing to discuss their ideas via ‘chat’ and other collaborative facilities within LAMS. “The decision to make LAMS freely available as open source software will be of significant benefit to education worldwide, in keeping with the founding spirit of the World Wide Web,” says Professor of Learning Technology at Macquarie University and inventor of LAMS, James Dalziel. “We know from many trials that LAMS has a profound impact on both teachers and students and could transform not just e-learning, but education itself,” Dalziel adds. The open source launch of the software under the General Public Licence (GPL) means that users will be able to look at, use and modify it freely. Linux and Apache are some of the best-known examples of open source software. Open source GPL software is also characterised by the fact that any user who modifies it and then redistributes it, must make the modified version also ‘open source’ (GPL). LAMS is managed by the not-for-profit LAMS Foundation, with implementation services provided by LAMS International Pty Ltd. Both organisations are supported by Macquarie University. LAMS will be launched as open source software by Macquarie University Vice-Chancellor Professor Di Yerbury at 6pm on Wednesday 13 April 2005 in the Yerbury Room, Level 3, SAM Building, Macquarie University. Prior the launch a three-hour pre-launch workshop will be held to demonstrate how the concepts of learning design and its implementation in the LAMS software can transform education and training. The LAMS Foundation is pleased to announce the public release of LAMS V2.0 alpha. This is a major milestone for LAMS, as it represents the initial release of the new architecture and platform for future LAMS development for the next 3-5 years. The announcement of LAMS V2.0 was made by Professor James Dalziel in a presentation at the OSS Watch "Open Source and Sustainability" conference at Said Business School in Oxford, UK. Details and downloads are available from http://wiki.lamsfoundation.org/display/lams/Home. LAMS International Pty Ltd today announced the LAMS Beta Partner Program at the "Altilab" Advanced Learning Technology Interoperability conference in San Francisco, USA. This is the first public invitation to educational organisations to trial the revolutionary Learning Activity Management System (LAMS). Organisations who have joined the Beta Partner Program include Oxford University, Cambridge University, the National Library of New Zealand, the Australian National University, and Christchurch City Council Libraries. LAMS is an innovative software program that allows teachers to design, manage and deliver online collaborative learning activities. They can sequence individual tasks, small group work and whole class activities, and incorporate 'Learning Objects' into sequences where appropriate. Teachers can quickly and easily change sequences by using a 'drop and drag' feature, and can easily adapt their lesson plans for different topics, and share these with other teachers. LAMS illustrates lesson planning for the digital age. "We are pleased to publicly announce the LAMS Beta Partner Program at Altilab," said Professor James Dalziel, inventor of LAMS. "This is the first open invitation to all interested educational organisations that wish to trial LAMS and contribute towards its ongoing development. We are excited to finally offer this opportunity to the many organisations that have been so keen to be a part of the LAMS journey," he said. Today's announcement follows on from the announcement of the LAMS roadmap last week at a function hosted by the UK Department for Education and Skills in London, UK. The highlight of the roadmap is that LAMS will be made freely available as open source software in February 2005. The roadmap includes release of an import/export feature for the IMS Learning Design Level A specification by July 2005. In addition to announcing the LAMS Beta Partner Program, LAMS International also announced the start of two major LAMS trials in the UK. The first is a trial involving up to 100 schools through the Specialist Schools Trust. The second is a trial and evaluation sponsored by the Joint Information Systems Committee (JISC) for 40 practitioners across higher education, further education and adult and community learning. The LAMS software is owned by the not-for-profit LAMS Foundation, with implementation services, including trials and the Beta Partner Program, provided by LAMS International Pty Ltd. Both organisations are supported by Macquarie University in Sydney, Australia. The UK Department for Education and Skills (DfES) is today hosting the announcement of the future roadmap for the revolutionary e-learning software called the Learning Activity Management System (LAMS). The inventor of LAMS, Professor James Dalziel from Macquarie University in Sydney, Australia, is making the announcement on behalf of the not-for-profit LAMS Foundation. LAMS is an innovative software program that allows teachers to design, manage and deliver online collaborative learning activities. They can sequence individual tasks, small group work and whole class activities, and incorporate 'Learning Objects' into sequences where appropriate. Teachers can quickly and easily change sequences by using a 'drop and drag' feature, and can easily adapt their lesson plans for different topics, and share these with other teachers. LAMS illustrates lesson planning for the digital age. LAMS is successful in not just schools and universities, but also in corporate and vocational training. The highlight of the announcement today is that LAMS will be released as 'open source software', meaning that the software code will be made freely available for use and development. The roadmap includes an invitation to partners to begin trials of LAMS immediately, the release of the full Version 1 product in November 2004, and release of the GPL open source code in February 2005 coinciding with the Version 1.1 release. An import/export feature for the IMS LD Level A standard is planned for July 2005. "This is wonderful news," says Professor Diana Laurillard, Director of the E-learning Strategy Unit at the DfES. "LAMS has the potential to transform teachers' and lecturers' capabilities to innovate in teaching and learning — I can imagine a future where every school in the UK may one day use LAMS." "By making this tool freely available, Macquarie University and the LAMS Foundation are making a significant contribution to education on a global scale." "The announcement of this roadmap is a fundamental moment in the development of LAMS — it sets the future path for this revolutionary software," says Professor James Dalziel. "Given this announcement, we look forward to collaborating with government and charitable organisations in the UK and internationally on further development and implementation of LAMS to the public benefit of education." LAMS is managed by the not-for-profit LAMS Foundation, with implementation services provided by LAMS International Pty Ltd. Both organisations are supported by Macquarie University in Sydney, Australia. LAMS has already received interest from around the world, with government education departments in Australia, New Zealand and the UK backing the software.